Durable protection lasts several weeks with ease! 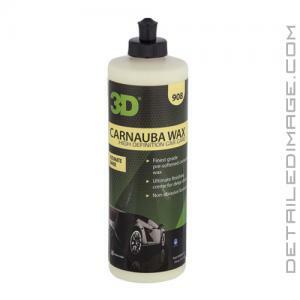 3D Carnauba Wax will help protect and enhance the depth of any color paintwork! This wax is a pre-softened, emulsified version of the popular 3D Carnauba paste wax so you can apply it with a buffer or by hand. Just a few drops to your applicator pad is all you need, so a little goes a long way. Apply nice and thin, let cure, and buff away any excess with a clean microfiber towel. This wax brings out a beautiful, deep and warm glow to various paint colors, but really makes dark metallic paints pop. The secret is in the high-end formula that is packed with the finest grade of white and yellow Brazilian Carnauba Palm waxes. This carnauba not only brings to the table a great look, but it also helps protect the surface for several weeks with ease. Best of all the product is an incredible value as very little product goes a long way. Therefore if you are looking for a high quality wax, the 3D Carnauba Wax is a fantastic choice! SHAKE WELL BEFORE USE. Prior to applying wax, make sure the car surface is clean. Apply a small amount of wax to the paint surface, spreading in a back and forth motion. Let haze and buff off with a microfiber towel to get a brilliant shine. If there are areas that are hazy or cloudy mist them with Final Touch and buff off with a microfiber towel. This product can also be applied with a DA polisher using a soft finishing foam pad. Best if applied in a shaded area.